In 1999, a little horror film called The Blair Witch Project became an instant sensation, grossing nearly $250 million worldwide against a mere $60,000 budget, and introduced audiences to a whole different kind of terror: hand-held cameras. Since then, the found-footage sub-genre it helped to define has led the way for films like Paranormal Activity, Cloverfield and Chronicle to shine and thrive, but it also led to countless horror films to be made on the cheap and marketed with their first-person angle as the main star, with a majority of them being utterly rubbish and without any real ideas of their own. 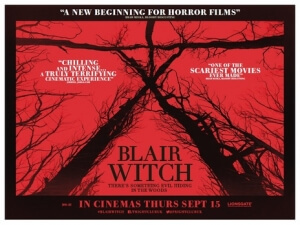 I suppose it’s only fitting, then, that Blair Witch – the official sequel to the first film, not counting the dire Book of Shadows: Blair Witch 2, which was made without the original filmmakers’ consent – brings the found-footage cycle full circle. It returns to the world of the film that defined the genre for the next fifteen or so years, but is exactly as rubbish and lacking in imagination as the numerous rip-offs that followed it. The plot of director Adam Wingard’s film is almost identical to the first film: a group of filmmakers venture into the Black Hills Forest in Maryland, USA, to hunt and document clues about the mysterious figure of the title, only for them to be attacked and messed around with supernatural elements as a result. The only major difference is that this time, instead of three people, there’s now double the amount, and one of them, James (James Allen McCune), is convinced that his older sister Heather – the main character from the first film – is still out there, twenty years on from her disappearance. Before it was unveiled as a follow-up to one of the most famous horror films of the last twenty years, it was originally marketed as The Woods, which from the previews just looked like a standard terror-in-the-woods movie that The Blair Witch Project would have influenced. I would have rather it had stayed that way, instead of being a direct sequel, because then I would have only been able to say it’s just a giant rip-off instead of something that was supposed to actually continue something. As a result, it’s impossible not to compare everything in this film to what came before it, and every time this film suffers greatly. The characters in this film, for example, are extremely obnoxious and douchey, constantly giving each other crap that nobody in their right mind would take as some sort of compliment, and are sometimes just unpleasant to be around. Sure, the characters in the first film were annoying too, but it was better executed in a far more natural and authentic way, so the frustrations they are going through seem all the more believable. Here, you just want to see them get killed or dragged away, which isn’t helped by their personalities that are only set up for them to make an exit as swiftly as possible. This, and anything else you can tie back to the original, makes this not just an inferior product – or project, if you will – but also just a doomed film with no legs to support itself. I knew I was already set for a long and drawn-out ride, which I was predictably bored senseless by just waiting for the next lame jump-scare to come about, but honestly the film lost me way before they even step foot into that fateful forest. A trend that I’ve noticed in several found-footage films as of late is an on-screen explanation for how they are capturing what is going on with multiple cameras – the use of phone cameras, older devices etc – but this one pushes it to an insane extreme, almost as though this film is actively cheating. Early on, we are introduced to a series of cameras that they put around their ears to give a first-person perspective – which must have been extremely expensive, because they have the quality of a camera used on a film set – as well as a drone that presents an eye-in-the-sky point of view. That just makes the found-footage aspect in this film feel extremely forced, and again it comes across as a poor excuse by the filmmakers to explain how they’re cheating by using multiple angles in a found-footage film. If they’re going to go to this extreme, then why not just make it an actual film instead? Yeah, that didn’t work for Book of Shadows, but at least then it tried something new, instead of just doing what the first film helped to define, but doing it far poorly. It really took me out of it, whereas with the first film they at least knew to keep the action as grounded as possible, only using two cameras instead of dozens, and it was ultimately more effective since you didn’t have any other angle to see what exactly was out there lurking in the woods. But really, throughout most of Blair Witch I was just bored. I wasn’t scared, I wasn’t enjoying any of these characters, and nothing about it felt fresh and new, something that – again – the first film actually managed to be, at that time. Aside from one sequence where a character must crawl through an underground hole (effective in its claustrophobia angle), nothing about this film stands out. I know nothing more about the Blair Witch mythos – in fact, I might actually now know even less – and thus Blair Witch fails to live up as not just a sequel to The Blair Witch Project but also as a found-footage movie in its own right. Like a lot of the terrible found-footage movies released in the original’s wake, Blair Witch is an ungodly irritating waste of time. Blair Witch fails to live up to the standards set by its genre-defining predecessor by rehashing a lot of the original’s elements poorly, and also fails as a film in its own right, with obnoxious characters and a forced found-footage angle.